One of my favourite creations is Madame LeClerc, the most sought-after modiste in Regency Bond Street. 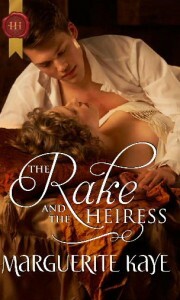 She first arrived to England in the company of Lady Serena in The Rake and the Heiress, set in 1816. 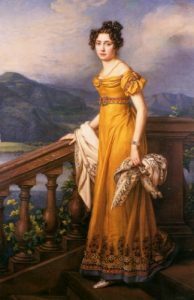 Madame was a Parisian exponent of haute couture with a healthy distain of English fashions who was anxious to make her fortune in London. The journey on the packet steamer made Madame heartily sick. She continued to be sick all the road to High Knightswood, punctuating bouts of nausea with trembling complaints of everything from the carriage springs to the state of the post roads and the dampness of the sheets at the post houses. She spoke very little English, obliging her employer to intervene when things became difficult. With a shudder, Serena recalled a particular episode involving Madame, the land lady of the Red Lion, and an un-emptied chamber pot. ‘Il pleut à verse. Rain, rain, rain,’ she exclaimed every day, regardless of whether the weather was inclement or not. Eyeing Madame LeClerc’s ample figure, hovering over her like a plump vulture, Serena found this last claim difficult to believe. 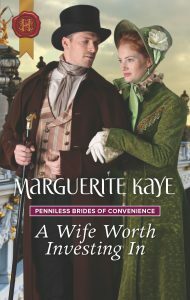 Nonetheless, Madame stayed in England, and made such a success of her business that she crops up regularly in my books, making a ballgown for Henrietta in Rake with a Frozen Heart, and entire wardrobe for Kirstin in A Scandalous Winter Wedding, and a trousseau for Eloise in my current book, to be titled The Earl’s Countess of Convenience. I don’t bear any resemblance to Madame (I hope!) 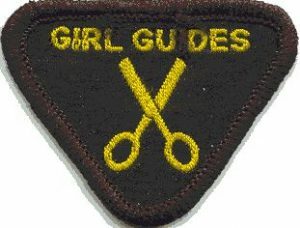 but I do share her passion for clothes, and so too does Eloise, the heroine I’ve just finished writing. And for once, art is imitating life. 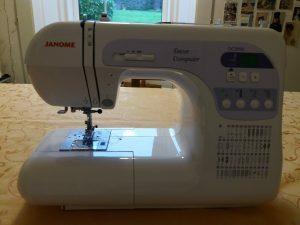 My mum is a fabulous seamstress who once had her own sewing business, so I could hold a needle almost before I could read (another passion my mum instilled in me). 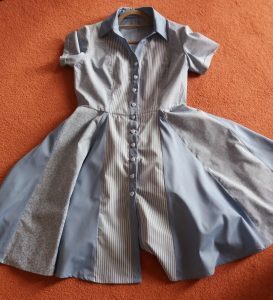 My mum made all us kids clothes w hen we were growing up, as most mums did back in the day. She used to make matching outfits for my Cindy doll from the leftover scraps – how cool was that, my own Cindy mini me! 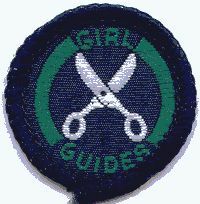 Naturally I sailed through my Brownies Needle Worker badge, and my Guides Sewing badge too – though I am ashamed to say that I cheated, getting my mum to sew the hem of the dress I submitted. 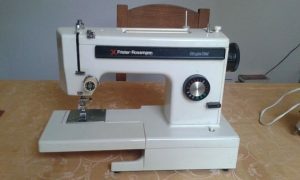 My gran gave me my first big girl’s sewing machine when I was ten. It was ancient and ‘sew’ heavy that I needed help to lift it onto the table. 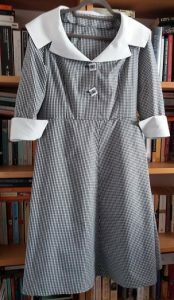 I don’t remember many of my early attempts at making outfits, but thanks to Dorothy L Sayers and my desire to be the new Harriet Vane, I went through an extended flapper period – so at that point my machine and my dresses dated from around the same era. 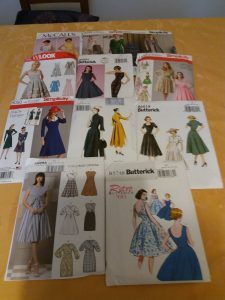 Zips and button holes were problematic as the machine only did very basic stitches, so I made a lot of pull-on dresses. 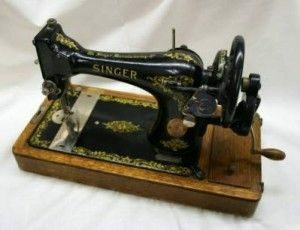 The machine I got for my twenty-first birthday was state of the art at the time, allowing me to major on blouses and button-up skirts. (Oh yes, and a lot of very ‘sensible’ work ware for the office.) But my true love has always been Vintage, and unlike flapper dresses, Fifties styles suit my shape. 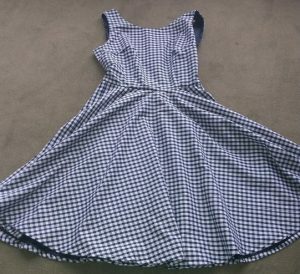 I made endless varieties of Dior new-look style dresses for weddings, and even went through a phase of making matching hats. And talking of matching hats, my Carmen Miranda dress and turban, bedecked with a bowlful of plastic fruit, won me first prize at my twin sisters’ 30th birthday party – the particularly competitive twin has never forgiven me for trumping her, admittedly spectacular, Cruella DeVille. Stepping over the threshold, faced with bales and bales of fabrics stacked from floor to ceiling, Eloise felt as if she had arrived in paradise. The plain silks were arranged by colour, the deepest shades on the bottom shelves, with the lightest at the top. Forest green bled into emerald, sea, pea, moss, sage and mint, then a pale hue Eloise had no name for. Mahogany became garnet, segued to vermillion, then scarlet, cherry and rose. The blues took up even more space. There were blues for every colour of sky, from a pale winter morning, to the azure blaze of early summer, the grey-blue of a stormy autumn day, and the indigo of a summer night. The golds and oranges could be used to construct every sunrise. White became silver became pewter which seeped into dark-grey then ebony. There were silks the colour of every flower Eloise had ever seen and more, an exotic desert garden of colours that made her head spin with ideas. In a trance, she wandered around the warehouse, caressing chiffon and crepe, georgette and gauze. And then she reached the figured silks, and stopped in awe, as an art-lover would before an Old Master. There were plain silks patterned with one colour, flowers and leaves in the most exquisite of stitches, white figured on silver, blue, green. On others, flowers spilled out in a riot of colour over a white or cream background, vibrant pinks in clusters on green stems or branches of gnarled wood so life-like that she felt she could pluck them from the fabric, bury her nose in their sent. The most costly and complex were the quilted silks, heavy with silver and gold thread, and the broad bands of finishing silks for hems and sashes which were so densely embroidered very little of the silk base was visible. Eloise has twin sisters, as I do, but at this point art stops resembling life. Estelle is musical and Phoebe a chef, traits which my sisters might claim but frankly is stretching things further than Mr Stretchy, the world’s stretchiest man being stretched on a stretching machine. Madame LeClerc must be getting on a bit now but I feel the old girl still has a couple of fleeting guest appearances left in her. Look out for her in future books. Think of it as a sort of Regency Where’s Waldo. Où est LeClerco anyone? 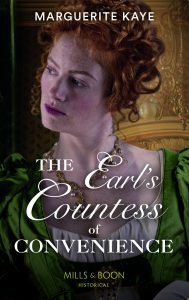 This entry was posted in Author Life, Book News and tagged A Scandalous Winter Wedding, Rake with a Frozen Heart, The Earl, The Earl's Countess of Convenience, The Rake and the Heiress, The Wedding Planner. Bookmark the permalink.